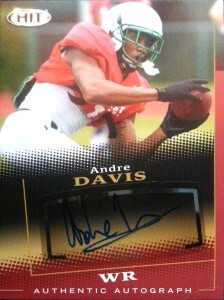 Andre Davis AKA ‘Freakshow’ piled up the numbers while at USF. While the quarterback position suffered from inconsistency, Davis took the advice of his position coaches who suggested he could take his game to the next level by watching more game film and doing the little things to tweak his game. He would go on to set the Bulls consecutive game catch record but missed 4 games in his Senior season due to a sternum injury. Still Freakshow earned team MVP honors with 36 catches for 594 yards and 7 touchdowns in 2014. He got a lot of attention at the Shrine game and coaches and players alike liked his willingness to make the play. Still Andre couldn’t shake his initial scouting report despite his productivity because his measurables weren’t eye popping. What is going for the young receiver is his intangible ability to make plays when it counts in game time situations. In early May of 2015 the Bills signed Davis to a free agent contract, where he has made serious noise for a roster spot with Buffalo. Caught in a numbers game, Davis was one of the final cuts at the end of the preseason. The Tampa Bay Buccaneers snagged Freakshow off of the waiver wire in October, where he found a home on their practice squad. He’d be cut in April of 2016 and is currently a free agent.